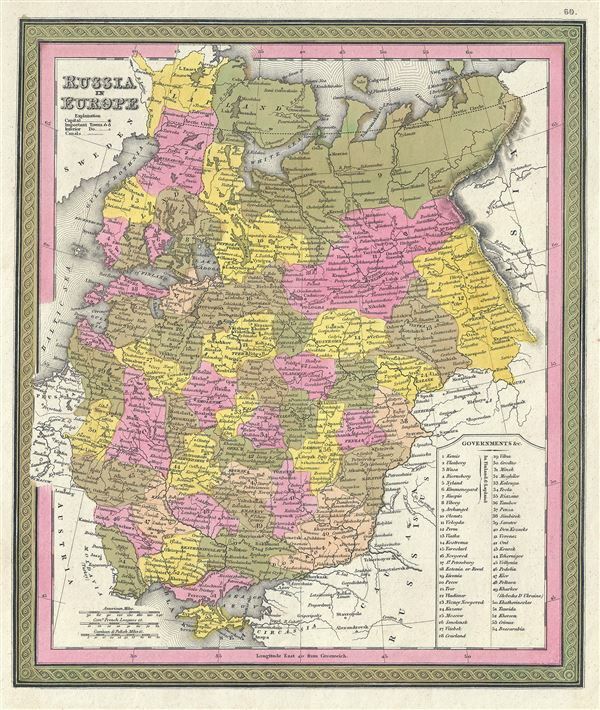 This is a fine example of S. A. Mitchell's 1846 map of Russia. The whole is engraved in Mitchell's distinctive style with green border work and vivid pastels. Political and topographical features are noted and color coded with elevation rendered by hachure. Mitchell's map covers European Russia from the Baltic to the Ural Mountains and from Lapland to the Crimea. An inset table in the lower right quadrant lists the regional governments of Russia. This map was prepared by S. A. Mitchell for publication as plate no. 60 in the 1846 edition of Mitchell's New General Atlas. Rumsey 0537.061. Phillips (Atlases) 814.